Okay, for those of you who might chuckle when you hear that some women buy their makeup from a not so high-end department store like Target, well,laugh no more. Target is aiming their bull's eye on some great beauty products. And the store is bringing mass appeal right into their shopping aisles. Thanks to 3 new collections for Target, you don't have to go running around looking for your favorite specialty products. Yes, the prices on this makeup are higher, but you are still getting excellent quality at a cheaper cost than fancy department stores. Famous makeup artists: Jemma Kidd, Napoleon Perdis, and Petra Strand, want to bring sophisticated cosmetics to women who might not wander into a Sephora or a Bloomingdale's. 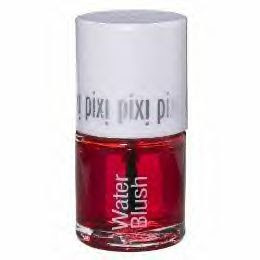 We took a look at Pixi's Water Blush in Chestnut Stain ($20). We liked Pixi by Swedish makeup artist Petra Strand best, when we examined all 3 collections. Her makeup ranges in cost from $12 to $49. We also like the ease of her cosmetics. As she put it: "Pretty, simple is my design mantra. Pixi makes it easy to wake up and go." Target is one of my favorite for beauty products & apparel too. Thanks, Hannah, for dropping by. I agree---there's plenty in Target to choose from....great makeup to clothing, and a whole lot more. Your website has some super coupons there. I'll be dropping in!